When we left off last week, I had a year-old baby who woke up regularly at night and would only nap in my arms. We were both exhausted and unhappy. Now, I have a toddler (going on 4) and a 14-month-old, and we all sleep beautifully. I’d like to tell you how we got here. And then she napped in her crib! I wish I could tell you how we did it, but I honestly can’t remember. It may have been a daytime cry-it-out, it may have just been that it got easier as she got older, or it may have been that over a course of months (years?) she slept away her sleep debt until she was rested enough to fall asleep on her own. Finally, Maggie was sleeping through the night and napping during the day. Newborn babies should only be awake for one to two hours at a time. Like, the baby needs to be asleep by the time two hours have passed. Meaning you might need to start the soothing process after the baby has been awake for an hour. Or even less. Seriously?! I had no idea. Did you have any idea? This is a serious question for me – is this something that everyone else learned somewhere or intuited, and I was the only one who didn’t know? Please comment below and reassure me that I was not the only one who didn’t know this! There IS a general pattern to how & when babies learn to sleep. Dr. Weissbluth explains thoroughly what you can expect from a one-week-old, a four-week-old, a two-month-old, and beyond. Although every baby is different, he believes (and I believe him!) that there are lots of typical patterns to look out for, be prepared for, and work with for optimal sleep success. Sleep begets sleep. 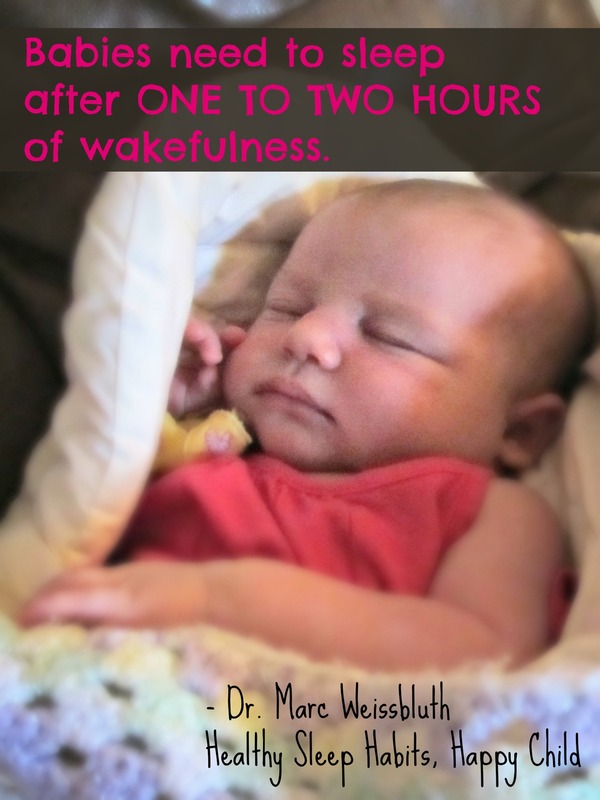 This principle guides a lot of Dr. W’s recommendations, like moving the bedtime earlier to deal with too-early morning wakeups (we now put both of our girls down at 7 PM), or focusing on quality naps to improve night wakings. My second child has been a champion sleeper from day one. Of course I know part of this is luck. Some kids are simply better sleepers than others. But I’m not ashamed to take part of the credit myself. I followed Dr. W’s recommendations to the letter, and took care to “protect the baby’s sleep” as much as possible. I think I optimized Elizabeth’s natural sleep abilities, and I’m really, really glad I did! If you are a new or expecting parent, please feel free to contact me (uncommonmotherhood at gmail.com) for further information about Healthy Sleep Habits; I took notes on that book as well as Happiest Baby on the Block and would be happy to send them to you. But I mostly think you should just click over to Amazon and buy Healthy Sleep Habits. I’ve gone back to it again and again for help with both of my girls. If you’ve read this far, thanks for sticking with me. God bless you and sleep well! Sheila, hi! Thanks much for the story. Until our first was 3.5 months old, I believe we were the lucky ones with an infant who fell asleep well on her own. This may sound like a paradox, but it probably helped that she wasn’t much interested in cuddling. So we would put her down, and she would fall asleep. Often I would sing a song, and that would also do the trick. What I didn’t know just before she turned 4 months old is that habits, rhythms, and even cues change. By 4 months, I was calling our little darling “Little Miss Never Nap”, and she didn’t seem ”darling” any longer. 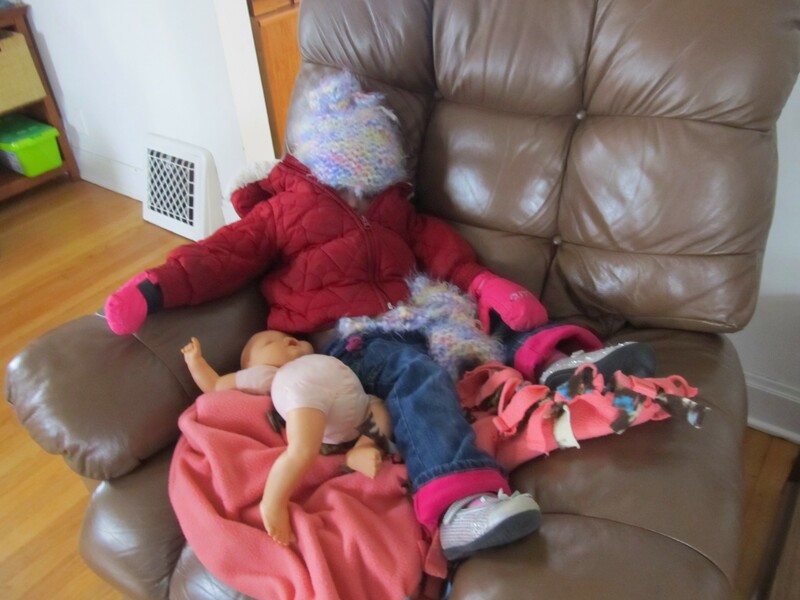 I would do exactly what I had done before, and each time it turned into a full on battle to coax her to sleep. Swaying, shushing, singing, bouncing. She fought me and I just intensified my efforts. I joked that I had to carb load the hour before our little race every day. Actually, I did in a way: pull the hair back, turn the fan on, drink lots of water, go potty, then go all in. Once I ever so softly did get her down in her crib, she would sleep no more than 17 minutes. I was so desperate and anxious, I knew each day how many minutes she had slept, adding up a few of these incidents. What I wished I had known then: there’s such a thing as the ‘four month slump’; baby rubbing her ears is a sign she’s tired (just like rubbing the eyes); Rebecca no longer wanted to be sung to sleep. I probably didn’t know that they should only be awake for 1-2 hours at once. I don’t remember either! I finally took a good hard look and listen at the screaming kid one day and realized that she was communicating to me “I just want to sleep! Put me DOWN!” Even though I was correct in this discernment, it took a little while to decide to let her cry it out. I finally went for it when a friend asked point blank “how much crying can you handle?”. I decided that I could handle it, and about 15 minutes. The first time it took maybe 17 minutes, and she slept for about 45. Again, at the time I knew the minutes precisely. It REALLY mattered back then. 🙂 Within about a week she was taking hour+ long morning naps, and they were 2+ hours every afternoon. I do remember that once we had this established, I noticed that she was tired and ready for her morning nap within an hour, and 1.5 hours max, of first waking up in the morning. This continued until she was almost 1 year old. After her first birthday, she still took 2 naps a day for a few months. But by this time, our second was on the way and I have even fewer memories – Mom Brain is one thing; combine it with Pregnancy Brain and, WHAM! ; Strange Brain. Question: Does anyone have any tips/tricks/cautions regarding getting a 9month old and and a toddler to sleep in the same room? Ours never have, and they are very social. I am thinking this will either help or harm their sleep :). Eventually, they do need to share a room, so I would love some thoughts on this. Uncommon Motherhood is a collaborative blog community of Christian moms who are striving together to put Jesus in charge of their everyday lives.